What are the best toddler activities for the beach? 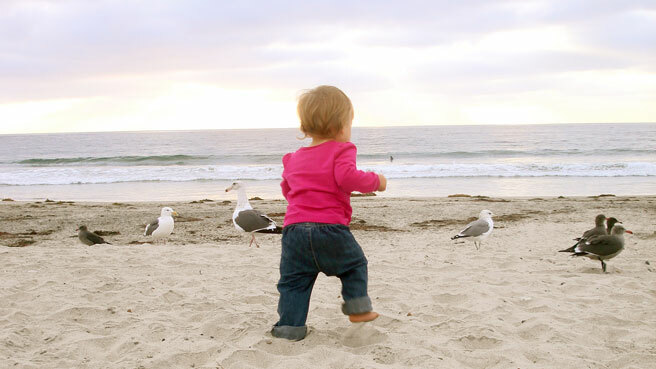 Many Southern California beaches have playgrounds or big grass areas to let your little one roam free. Here are some fun things to do with a toddler at at the beach. 1. Bring plastic recyclables like cups and juice bottles. Let your toddler fill them with sand or water and dump them out. 2. Dig a hole she can climb in, or make sand stairs she can crawl up. 3. Drag him on a boogie board through the wet sand above the water line. 4. Bury her feet in the sand, and ask where her feet went. 5. Let him chase seagulls, just this once. 6. Carry her into the water waist-high and then watch her face as you jump for the waves. 7. Get a head start on learning by writing his name in the sand. 8. Dip her toes in and out of the whitewash. 10. Fly a kite, preferably of a Sesame Street character. Be careful of the string. 11. Take pictures of him with his mouth covered in sand. 12. Find other kids’ toys and ask if your toddler can play too. Look for the beachgoers with the red wagons for the best toys. Enjoy this time with your child and reward yourself with Happy Hour later!